Davide Valsecchi was the GP2 Champion of 2012, but his F1 experience is so far limited to some Young Driver testing, plus some Friday free practice appearances for Caterham and Lotus. Although often in the frame for a race drive Davide was overlooked by both teams, missing out on an opportunity to fill in for an injured Kimi Räikkönen. Valsecchi worked solidly through Italian and European Formula Renault championships, followed by Formula Three and Formula 3000. It was GP2 where he really made his mark, though, winning the championship in 2012. That put him firmly in the sights of Formula One, where he had already been testing and forging relationships with teams. He drove for Hispania Racing at the Young Driver Test of 2010, and became a Team Lotus test driver for 2011. 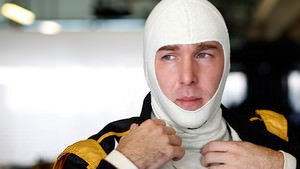 During the 2013 season, Valsecchi made the move to the Lotus F1 team as a test and reserve driver. When Kimi Räikkönen left the team early due to a back injury, Valsecchi was expected to take the drive for the final two races of the year. However, the role went to Heikki Kovalainen which left Valsecchi on the sidelines. In 2016, Valsecchi joined the Blancpain GT Sprint Cup series, participating in five races during the year. It is Davide Valsecchi who has caused the red flag, the Lotus stopping out on track at turn 3. Davide Valsecchi sets his, and Lotus', first time of the day, a 1:26.106. Meanwhile, Romain Grosjean is hurrying back. According to Autosport's most excellent live commentary: "Kimi Räikkönen is ill and will be replaced by Lotus reserve driver Davide Valsecchi this morning. Romain Grosjean, who finished his pre-season programme yesterday, has been told to turn around and come back to the track. He is due at Barcelona this afternoon."